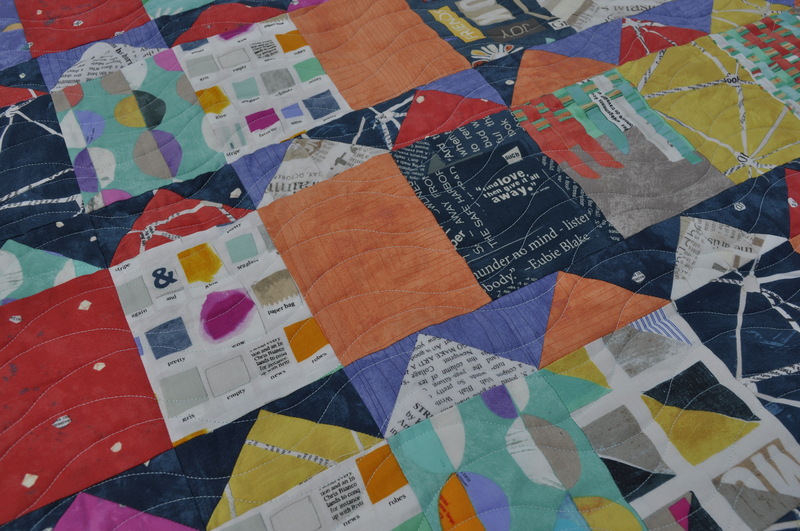 As a quilter, I can't think of many things more rewarding than seeing your quilts in print. Having one of my quilts featured in a book or magazine allows me to share my work with quilters from all around the world, and I get the warm fuzzies thinking that I might be delighting and inspiring others. And when it's not just a quilt but also an original pattern of my own -- one that others might also choose to make themselves -- it makes me downright giddy. Recently, I've been fortunate enough to have a few of my quilts featured in an exciting and relatively new publication, Quilt Now magazine. 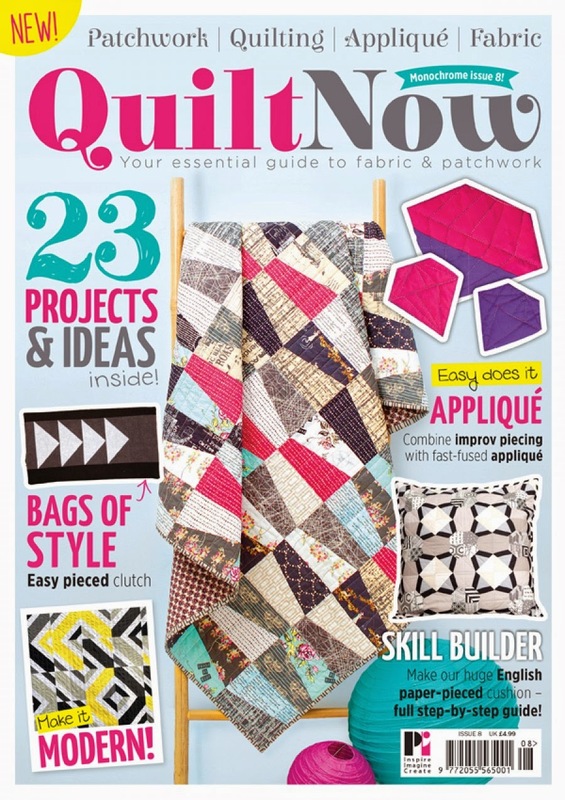 Based out of the UK, Quilt Now is helmed by my quiltsister Katy Jones as editor and recently celebrated its first year in print. Earlier this year I had my first quilt featured in issue 8 of Quilt Now. 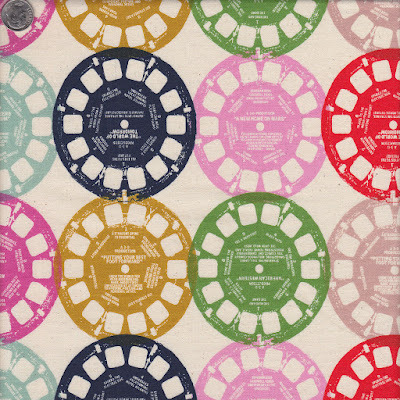 Each issue of the magazine centers around a theme, and the theme for the eighth issue was "monochromatic quilts". I have kind of a love affair with grey prints, so I set about making quilt top with a scrappy mix of a wide variety of grey and white (aka "low volume") fabrics. 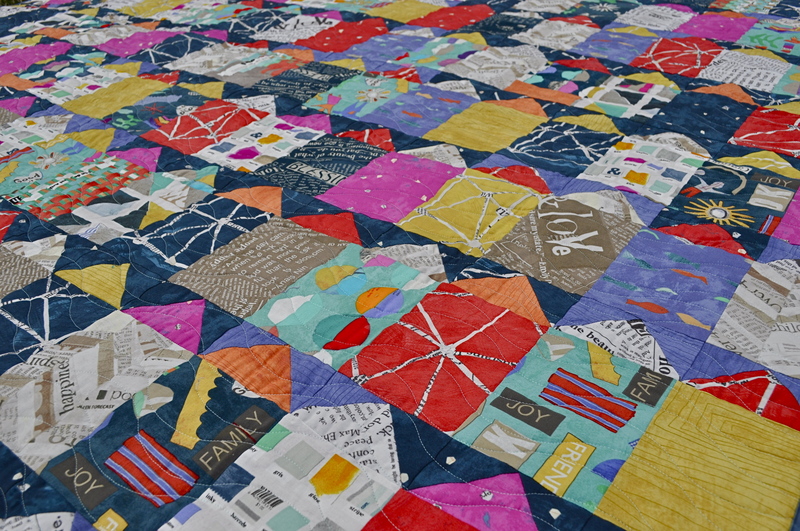 Big thanks to Katy and the great team at Quilt Now for featuring the Dreamtime quilt! I hope you'll check out their gorgeous magazine and let me know if you decide to make a Dreamtime quilt of your own. Hello everyone, and welcome new visitors! 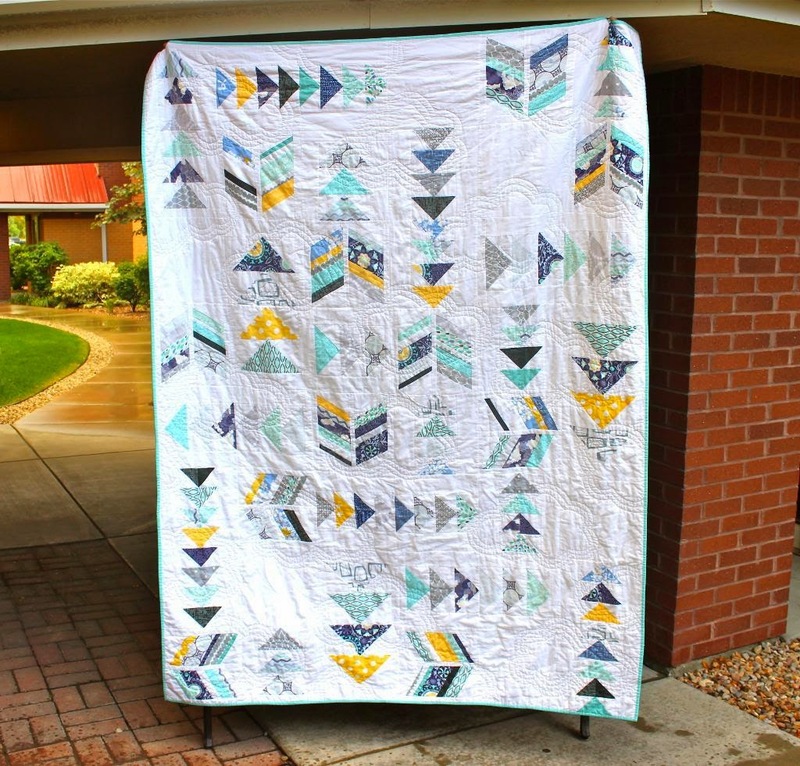 Just a quick post today to share one of my recent quilt top finishes and let you know about a fun new free quilt pattern offered by my friends at Art Gallery Fabrics and the Fat Quarter Shop. You may have seen my post a few months back about the Birchen quilt pattern, the first in the new AGF Stitched series of free patterns and projects born out of a collaboration between Art Gallery and the Fat Quarter Shop. I was excited to be asked to join in the launch of the newest pattern in the AFG Stitched series, the Welded quilt. I've had the chance to make my own version of Welded, and I can attest to the fact that it is a fun, beginner-friendly pattern that delivers great results. I always love a quilt pattern that is able to showcase my favorite large prints, and Welded certainly fits the bill. The Art Gallery Fabrics portfolio of designers and fabric lines has grown so much that it's always difficult to decide what fabrics to use for these quilt patterns. For Welded, I decided to play with my good friend Katy Jones' line for AGF, Priory Square. That navy blue "clippings" print, with its collage-inspired mix of floral images and hand-drawn birds, is a new favorite of mine. Though I finished the quilt top per the pattern instructions, I'm not quite done yet. I'm waiting for some more cuts of the fabric to arrive so that I can add some borders and increase the size of the quilt in order to make it a bit more queen-sized bed friendly. This one's going to be a Christmas present for someone! I will admit that I found the on-point layout of the blocks and assembling the quilt top in rows a bit tricky. Actually, the tricky part was trimming the edges of the top once it was assembled. I had to trim a bit more off than expected, because my row ends didn't quite leave me a straight line for easy trimming. I'll chalk that one up to a learning experience. 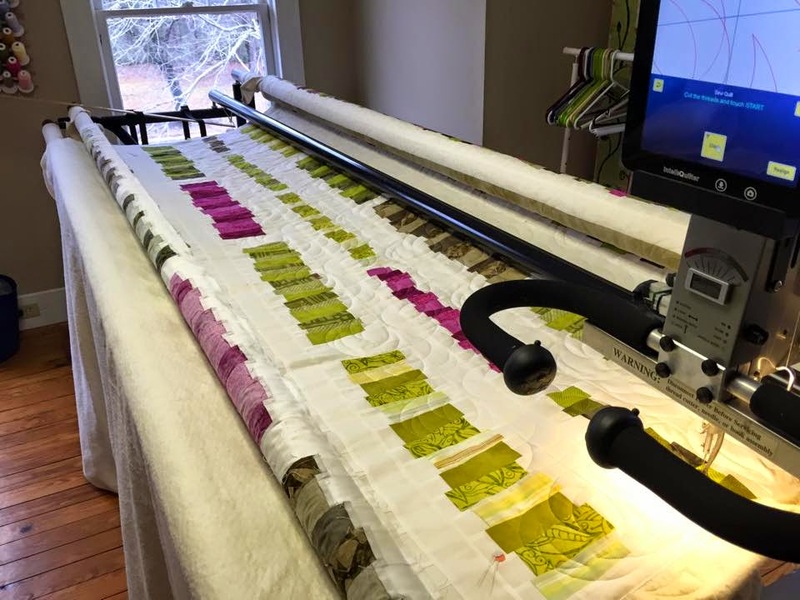 As always, the Fat Quarter Shop team has done a great job putting together materials to make your quilt-making experience as easy and enjoyable as possible. These materials include the pattern, quilt kits, and a YouTube video that you can find below. There is a whole bunch of other talented quilters showing off their Welded quilts today. Go check 'em out and say hi! Dana of Old Red Barn Co.
Hello, quilt-alongers! (Or is it quilters-along? I never know.) I am so sorry to be posting the week 1 post so late in the week. The truth is, I've been putting off writing this post in the hopes of completing my Part 1 but -- and I'm you see where this is going -- I wasn't able to keep up. No worries -- I'll still fill this post with tips, tricks, and plenty of eye candy for all of you playing along. And for those of you that make it to the end of the post, look out for a fun giveaway! 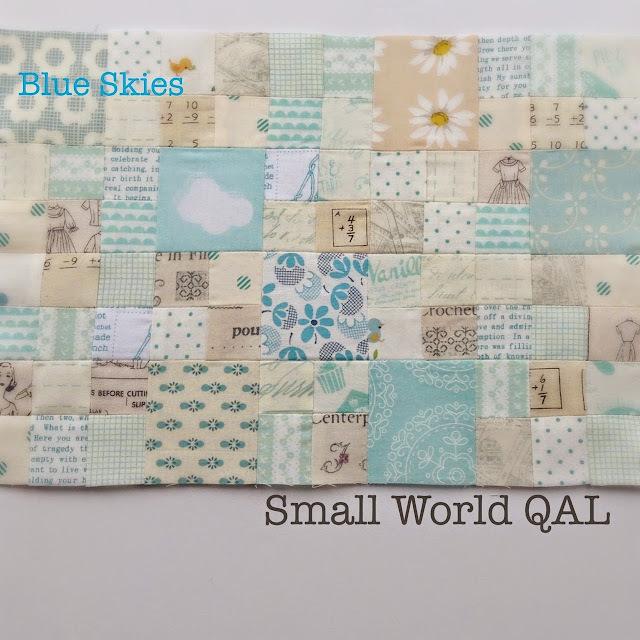 Even though I haven't been able to complete my part 1 yet, I've certainly been following along with all of the action on Instagram at #mysmallworldqal. 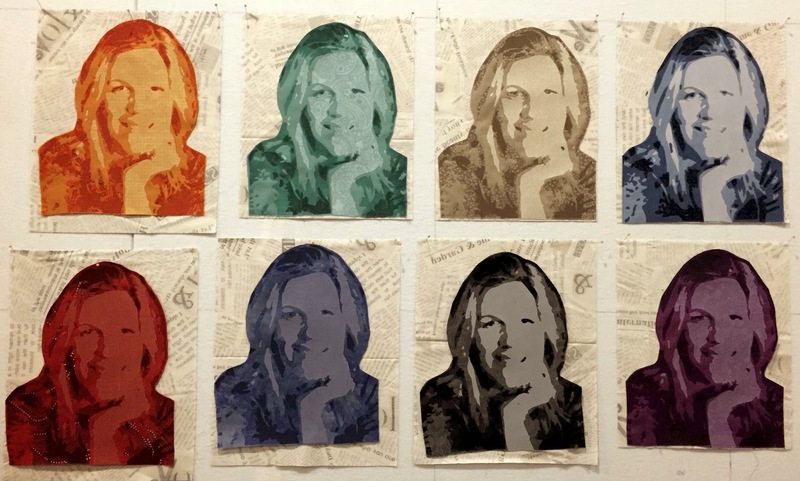 The general consensus seems to be that: (1) the piecing is quite small; (2) striking the right balance of low volume prints for the sky can be challenging; (3) participants are finding the small piecing to be quite time consuming; and (4) despite 1-3, this project is a ton of fun! Since section 1 starts with piecing the patchwork sky, I've taken particular note of how people are handing that part. 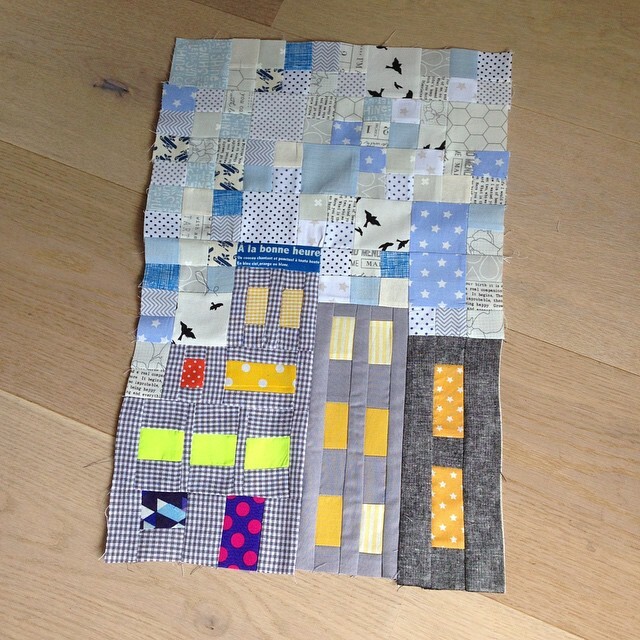 It's been interesting to see that some quilters are sticking to straight low volume, others are introducing bits of blue, others are leaning towards a sunny yellow sky, and at least one quilter that I know of (Angela of Cut to Pieces) has chosen to piece a fabulous dark night sky. Here's co-host Kerry's completed part 1. Amazing! One thing I am definitely not interested in doing in hand-sewing hexagons. So when I saw diagram 25 in part 5 of the pattern, I knew this was a job for a cheater print. I found this great cheater print (also at Superbuzzy) that fits the bill perfectly. 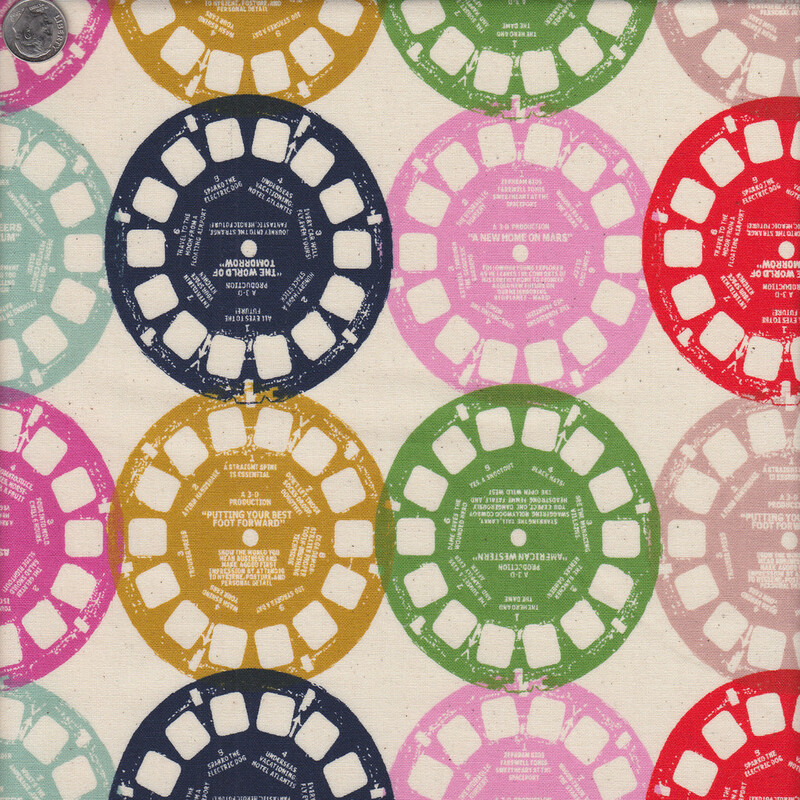 Next, when I see all of the half-circle motifs throughout the quilt (see part 1 illustration 9, part 3 illustration 17, and the half dresdens in part 5), I can't help but think there's some way to use Melody Miller's viewfinder fabric from Playful (for Cotton + Steel) to create this effect. 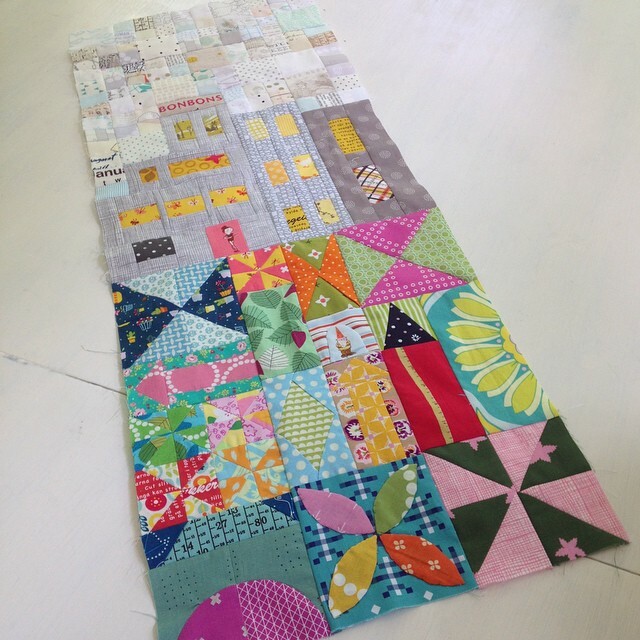 Are you quilting along and have finished Part 1? 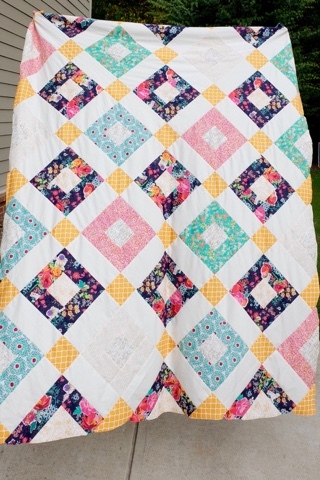 Join the link-up party below and share your quilt! I'll choose one post from the list below to win a special fabric giveaway prize -- some items from my stash custom selected especially to coordinate with your quilt -- sometime next week. Want a button for your blog? You can find them on Kerry's blog post. 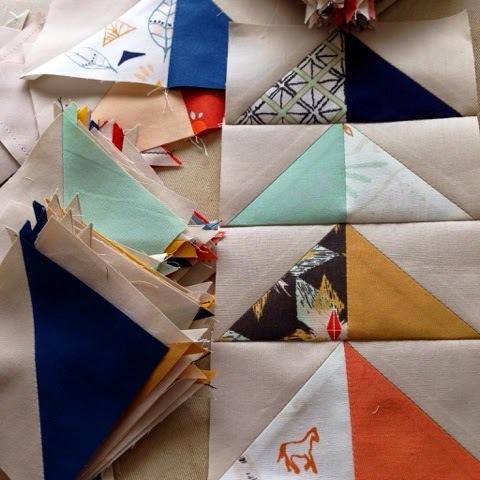 If you're quilting along with us, now's the time to make sure you have your pattern and start pulling out fabrics for your quilt. As soon as I saw the pattern, I fell in love with it. Does it have some small, fussy piecing? Yes. Hand sewing? Yes. Curves and dresden plates? Yes. And if you follow my blog, you know that none of those are my favorite things. But I am confident that I can work around some of those challenges and still enjoy the process. For example, I will be relying on fusible, raw edge appliqué instead of hand sewing or EPP. Semicircles? I'll be fusing those down too. 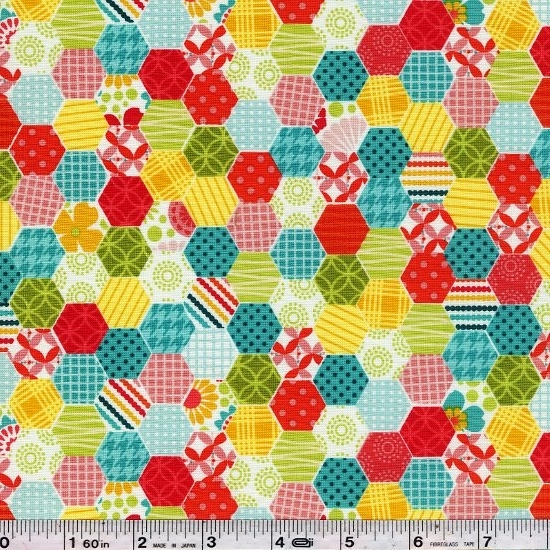 And I'm on the hunt for some great cheater prints (squares and hexagons) that might work in the some of the patchwork areas and instead of the EPP bits. If that stuff interests you, let me know and we can share tips and progress. 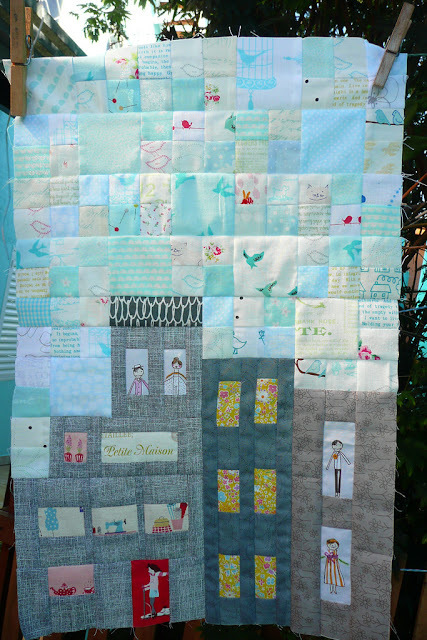 And please share links to any cheater prints that you know of that might work in the quilt. 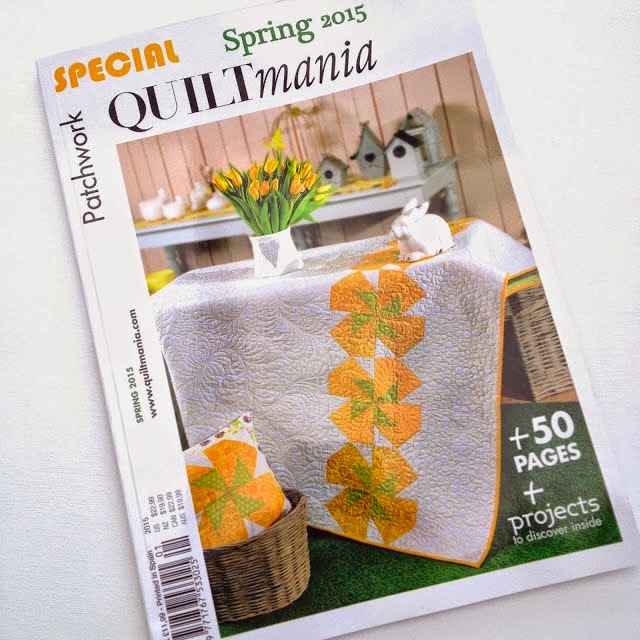 The pattern can be found in the Spring 2015 Special issue of Quiltmania magazine. It's not the easiest issue to find, but we've been compiling a list of shops and stores where it's been spotted. If you have any additions to the list, please let me know in the comments to this post and I'll update the list. Online at The Contented Cat. They will also send overseas - a possible option for European quilters. Online at Coast and Country Crafts. One copy left at the time of writing! Online at The Running Chicken. Listed here, new copies arriving 8th May and they will send overseas. Quiltmania website available in English and French. They send anywhere in the world. The power of quilt-along such as this come from the community that is participating and the activity and excitement that it generates. 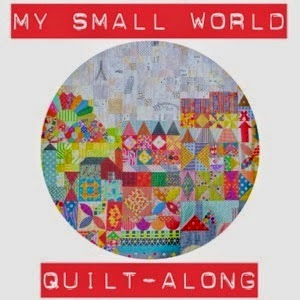 There is already a great deal of activity carrying the hashtag #mysmallworldqal on Instagram, Twitter and Flickr, so be sure to contribute your progress pictures. Jen Kingwell herself and the nice people at Quiltmania will be following along as well, so you may see some nice comments from the designer herself! The schedule for the quilt-along can be found below. The pattern is presented in six parts, which is how we will be proceeding. We hope it's provides a comfortable pace with which to keep up, enjoy the progress others are making, and get any and all of your questions answered. 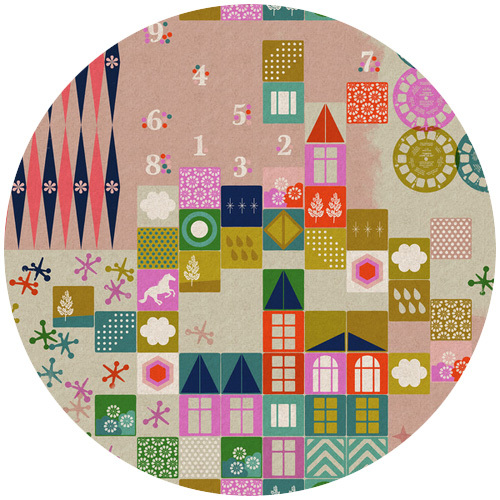 We'll kick of the piecing next week with part 1 right here on my blog! Week beginning 18th May - Intro post - All hosts will be posting! Week beg. 28th Sept - Finish - All hosts will be posting! 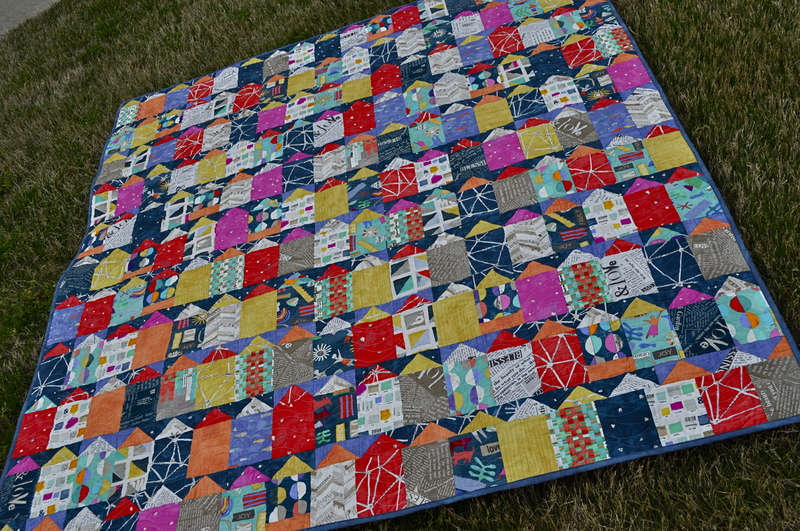 Will you be quilting along? Let me know! Leave a comment below. Seeing that we're neighbors, I've had the pleasure of getting to know the shop's owner, Julianne Walther. It turns out that Julianne and I have quite a bit in common. Aside from a love of quilting, we are both parents of multiples (twins!) and spend the majority of our free time cheering our children along from the sidelines of a soccer field. 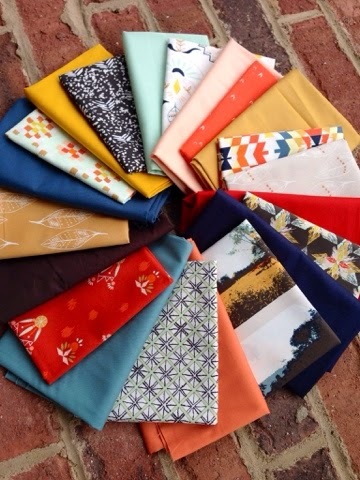 I wanted to showcase Julianne and her shop here on the blog, and she has been kind and generous enough to offer a discount to Cary Quilting Company for Quilt Dad readers as well as a fabric giveaway. Details on the offer & giveaway -- as well as a link to one of Julianne's free patterns -- are at the bottom of the post but, in the meantime, enjoy learning more about one of our community's local shop owners! 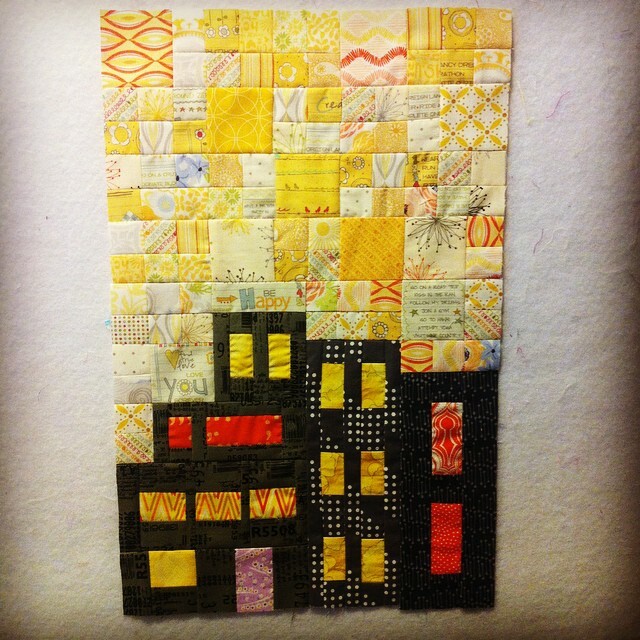 How did you get started with quilting? My mother taught me to sew as a young child. I made myself lots of clothing in high school in college, but I was often disappointed with the fit or drape. In 1995, I decided that if I made a quilt, it would have to fit. The bed wouldn’t gain or lose weight, and a two-dimensional quilt would have to be easier, right? I bought myself a “make your own sampler quilt” book and I never looked back. What made you decide to open a business? In 2005, I had 4 kids aged 5 and younger, and I was a stay at home mom. I don’t sit still very well, and needed something to do during naptimes and after the kids went to bed at night. 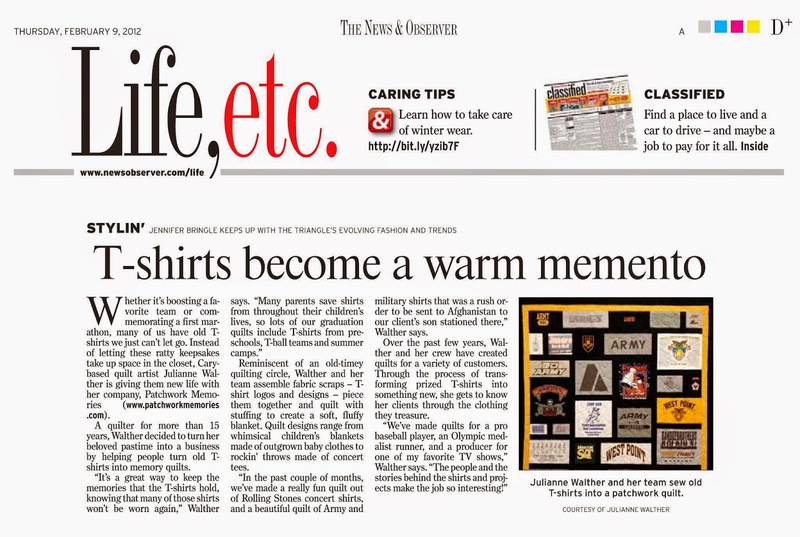 My husband created a little webpage for me, Patchwork Memories was born, and I started making t-shirt quilts for people. 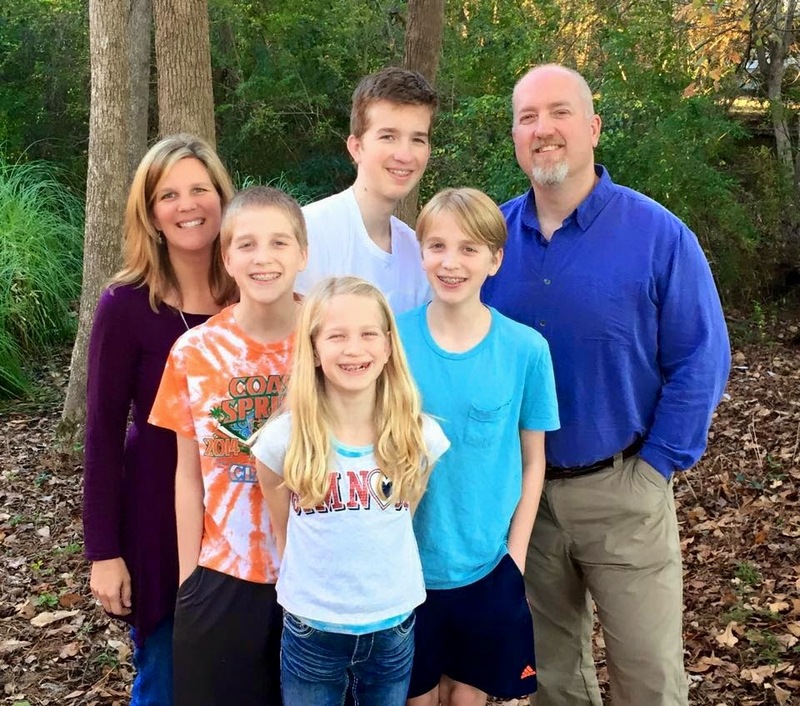 Seven years later, Patchwork Memories had grown to a 10-person company in need of more space (that didn’t include 3 pets and a toilet that was used for aiming practice by three boys). We moved the company into a beautiful historic house in downtown Cary. The house had been empty for a couple of years and was was the prior home of Etc. Crafts, my local quilt shop. Almost as soon as we had moved in, quilters were knocking on the door, wanting to know when we would be opening our quilt shop. We got busy and a couple of months later, we opened a quilt shop! 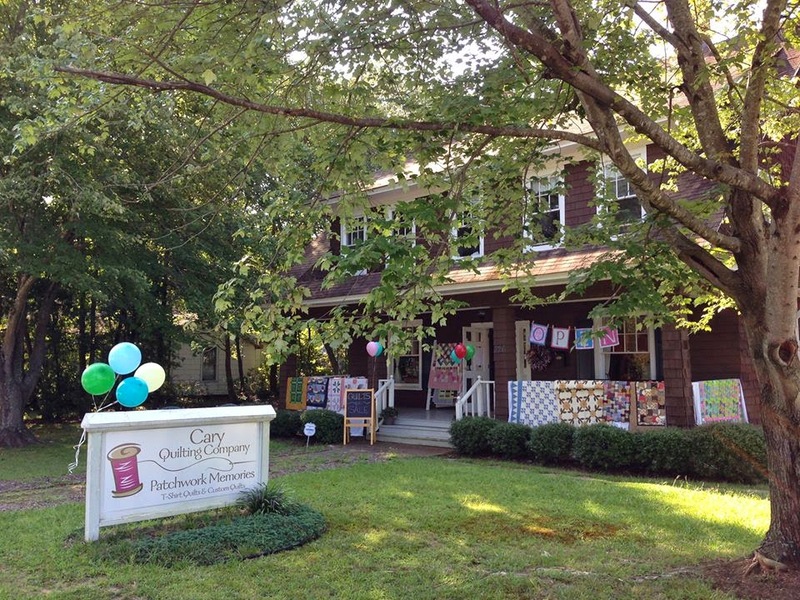 Now, Cary Quilting Company operates from the first floor of the shop and Patchwork Memories operates from the second floor. We also have a classroom and a long arm quilting machine on the second floor. 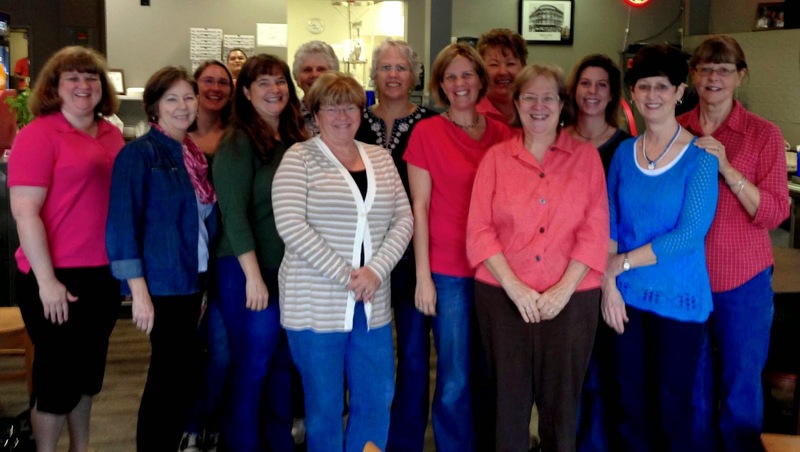 What are your favorite parts about owning a quilt shop? I love shopping for new fabrics, and I really love when the boxes arrive! It’s like Christmas day every time we get a new shipment of fabric. It’s a little frustrating because I love everything that comes in (since I chose it! ), and I want to make quilts and bags and projects with everything in the shop. There’s just not enough time in the day. I also love the people! 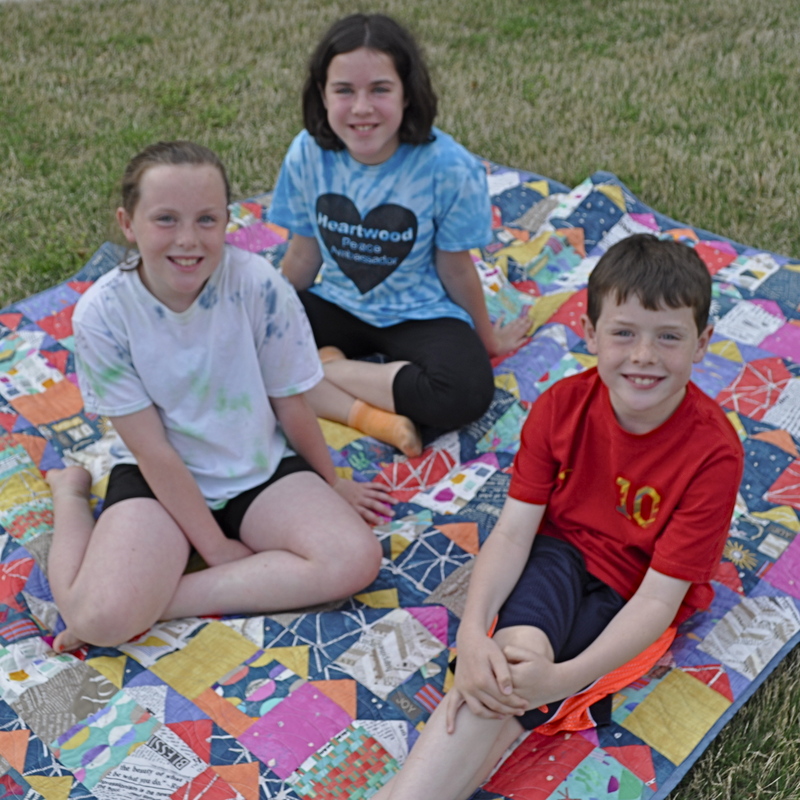 Seeing how proud people are when they bring in show-and-tell, seeing inspiration come to life, and helping people find just what they need for their quilts is so fun. What types of quilting do you enjoy? I’m all over the map! I love paper piecing, machine applique, traditional piecing, modern quilts, batiks, solids, prints, novelty, you name it! I really love quirky fabrics. 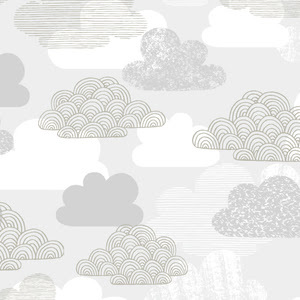 Some of my recent favorites are Packmate Llamas by Michael Miller and Farm to Fork Bacon fabric. What do you do when you’re not at the shop? My 4 little ones are now 4 bigger ones - aged 10 - 14. I’m either in the car, at a soccer field, at the orthodontist (yes, all 4 are in braces!) or at gymanstics with the kids. I also run half marathons and sometimes I even sew. Don’t ask me to cook though - you’d regret that request pretty quickly! 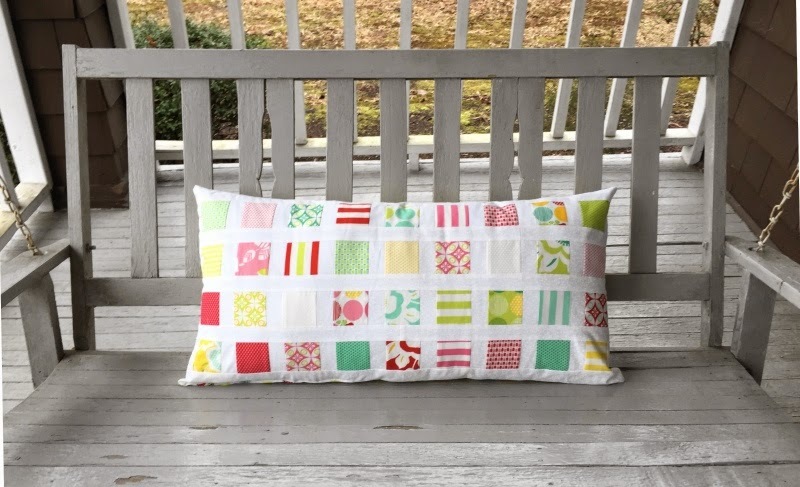 A fun bench pillow made from a mini charm pack and 1 yard of fabric. Julianne's free pattern is featured on the Moda Bake Shop. If you ever find yourself in the Raleigh area, make sure you carve out some time to go visit Julianne and the staff over at Cary Quilting Company. Oh, and be sure to contact me first -- I'm always happy to go fabric shopping, and I'll buy you a cup of coffee! A winner will be selected on Friday, May 1st. Good luck! Welcome to the Story party! I was so excited when Carrie (Bloomston, of Such Designs) asked me to make a project inspired by her new line for Windham Fabrics, Story, and I'm even more excited to be sharing it with you today. It turns out this quilt took on quite a story of its own. First, though, a bit about the fabric line. From Carrie's post: "Story is about community, connection and the essentials of life: home, family, love, garden, nature, stars, moon, sun, animals, friends. In Story, you’ll find archetypal building blocks of your personal narrative. What is your story? Tell us. Share it. Add to it. Make it yours. When we share ourselves with the world, we become whole." Not only did Carrie ask me to make a quilt with this beautiful line, but she invited it to be featured in her lookbook to help showcase the line. To be included, the quilt had to be back to Carrie in time for the photoshoot. I quickly sketched out my design and set myself a (very aggressive) timeline to get the quilt made and off to be longarm quilted in time to send back to Carrie before leaving for a 2.5 week business trip to Australia. It was going to be tight, but I was certain I could do it. 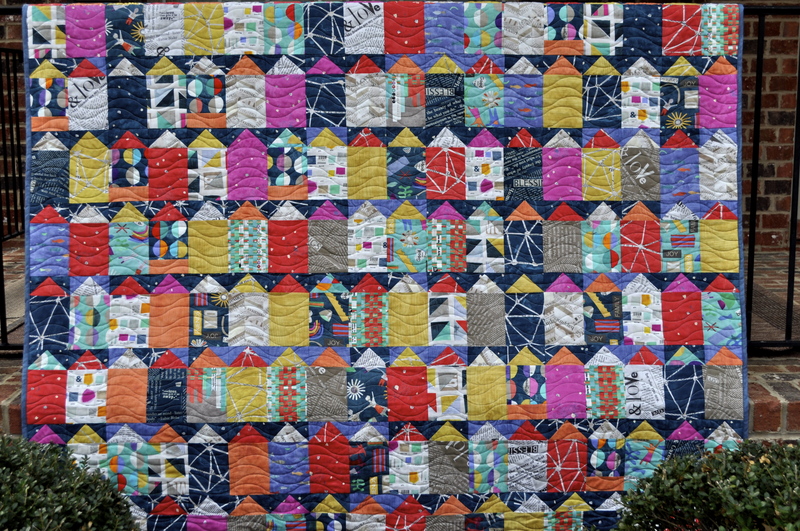 With a fabric line so chock full of stories, I immediately knew that I wanted to make a sea of houses and build a patchwork town or city. 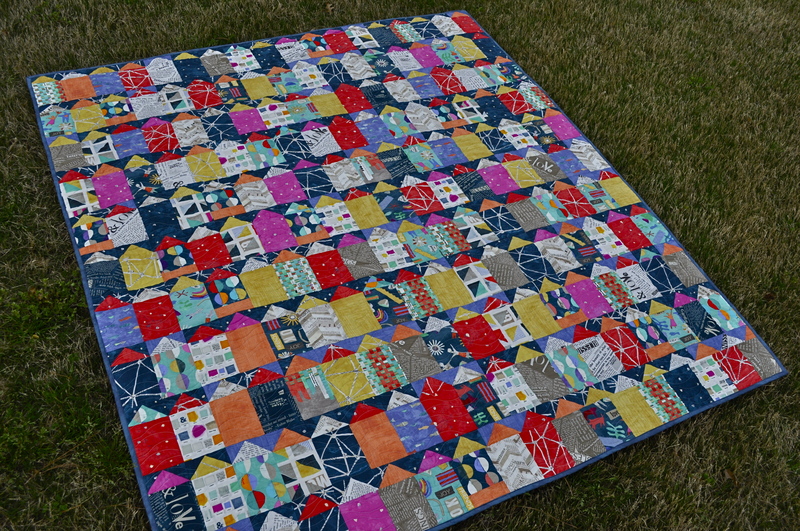 Made from two very simple shapes -- rectangles and flying geese -- the quilt is abstract enough for anyone to inject stories of their own into this little patchwork town. I absolutely loved making it. Well, towards the end of construction, I was really down to the wire. The quilt top was (of course) taking longer to complete than I was anticipating, and the Saturday night before my business trip I settled down for a long night of sewing. As long as I got it to Mark and Suzan at Singing Stitches to work their quilting magic on Sunday, I could keep to my schedule. But at around 11PM I started having some pretty severe back pain. I've had back pain before, but this was like nothing I had ever felt before. And no matter how I moved or sat, there was no relief. To make a long story short, I ended up driving myself to the emergency room at 4AM to learn that I was experiencing my very first bout with kidney stones. It was NO FUN. Aside from the physical pain of the ordeal, there was no way I was getting the quilt done before leaving for Australia. I had to let Mark and Suzan know that I wouldn't be bringing them the quilt the next day. And I had to let Carrie know that the quilt would not be ready in time to be included in the lookbook photoshoot. I was really heartbroken, but also excited to complete the quilt once I was home without the stress and discomfort that I was beginning to associate with it. And so I present "Your Story Begins at Home". Like life, the story is both about the good and the bad. 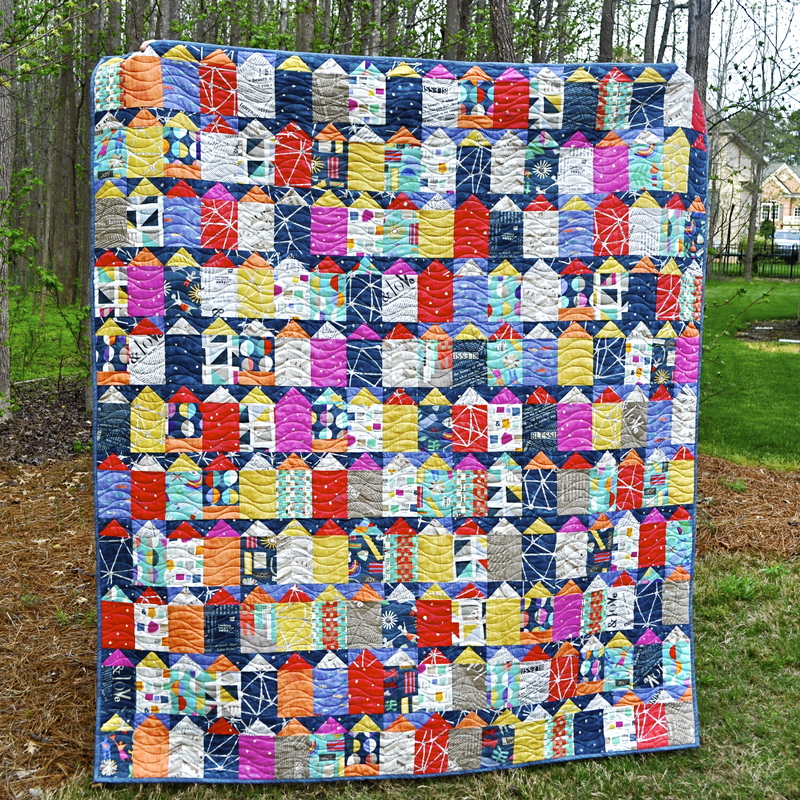 Though the story of this quilt so far has had more downs than ups, I am sure that will change as it makes its way to Quilt Market and does its part to showcase Carrie's beautiful new fabric line. And once it's home, we'll be sure this quilt is well used and well loved. Back today with a quick recent finish. 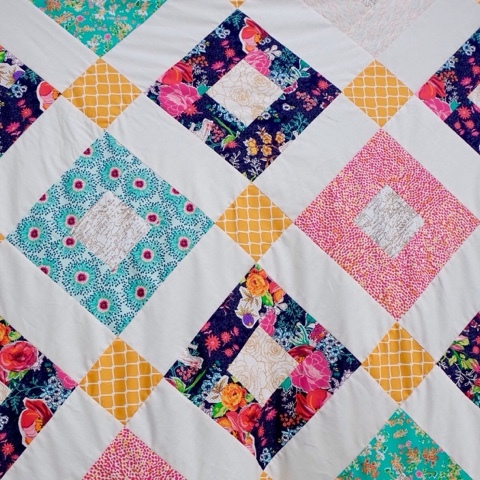 I was happy to work with my friends at the Fat Quarter Shop to make their most recent (free) Short Cuts pattern, the Charm Box Quilt. I made mine using Rashida Coleman-Hale's new line for Cotton & Steel, Mochi. This was really a quick, fun, and easy quilt to make. It uses 2 charm packs, plus less than a yard of a background fabric. The quilt finishes at 36" x 45" -- the perfect size for a crib or baby quilt, or even a wall hanging. I loved working with Rashida's collection. The colors and prints are unique, vibrant, and lots of fun. 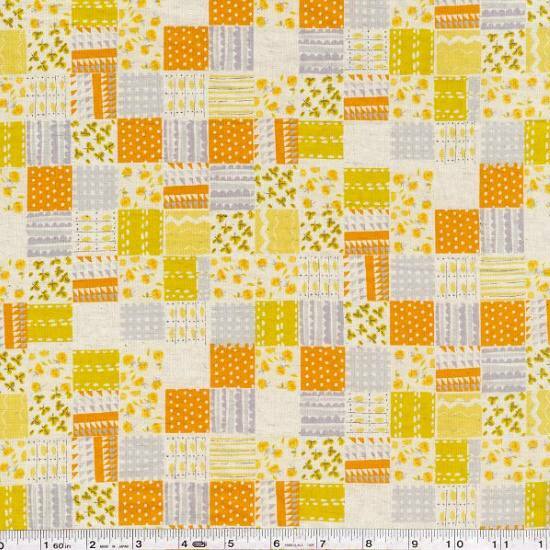 Most of all, I've fallen in love with the background fabric I chose: Dottie's Cousin in Natural. 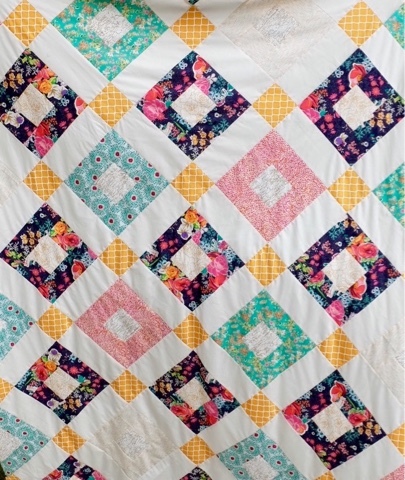 It's got a linen-y look and feel, but is pure quilting cotton so that it sews beautifully. It's the perfect blender / neutral. Enjoy! 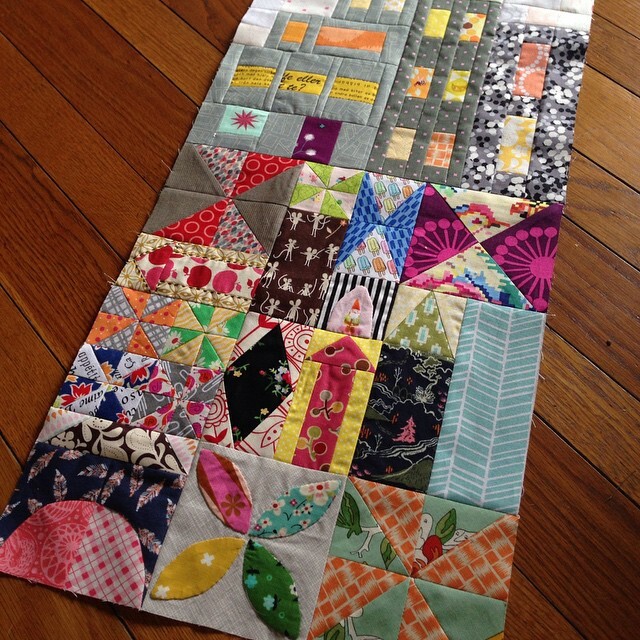 If you make a Charm Box quilt, I'd love to see it. Link it up in your comment below! 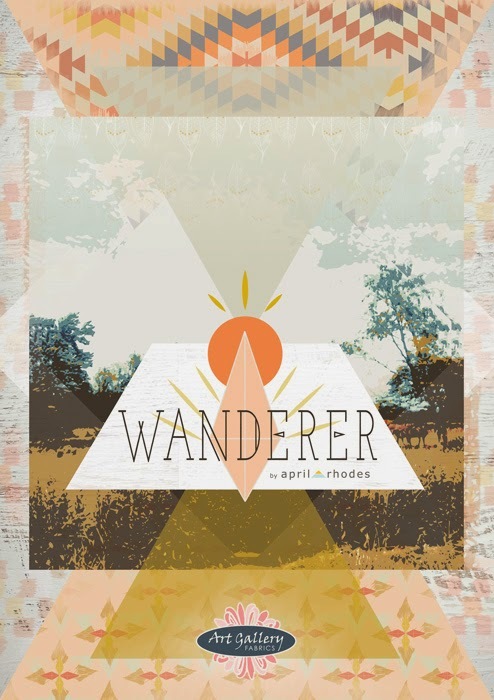 So when April contacted me and asked if I'd like a bit of early-release Wanderer to play with, I did 3 back handsprings and sang a few spirituals (OK, not really) before answering with a resounding YES. I supplemented April's beautiful prints with a few coordinating AGF Pure Elements solids and began thinking about what I would make with them. At around the same time, I finally got around to checking Craftsy out. (A bit late to the party, I know.) 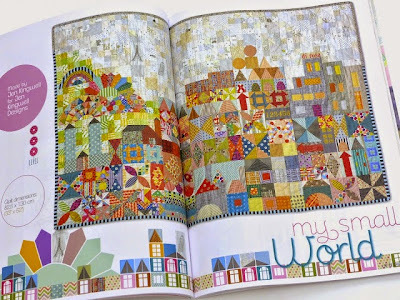 What a great resource for quilt patterns and ideas! 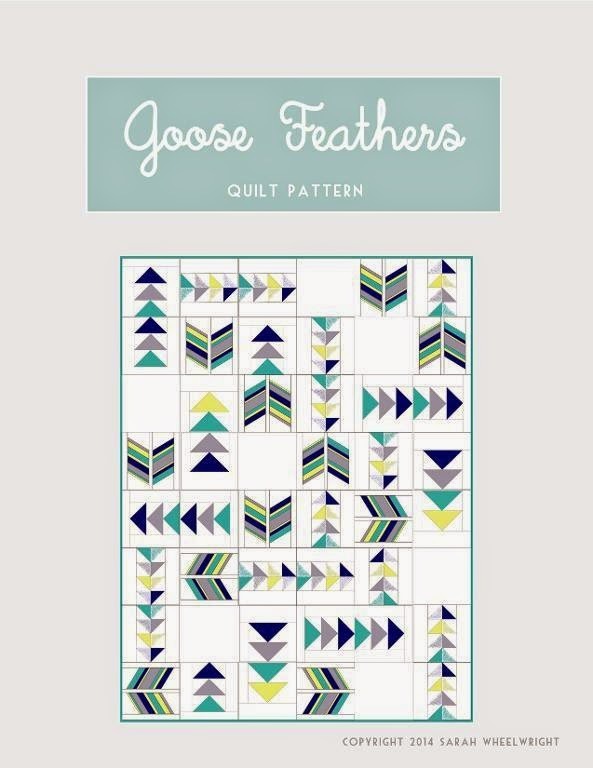 I stumbled across a pattern called Goose Feathers by Sarah Wheelwright and, I swear, I heard fireworks going off. It's a great fit for what I wanted to do with my Wanderer stack. 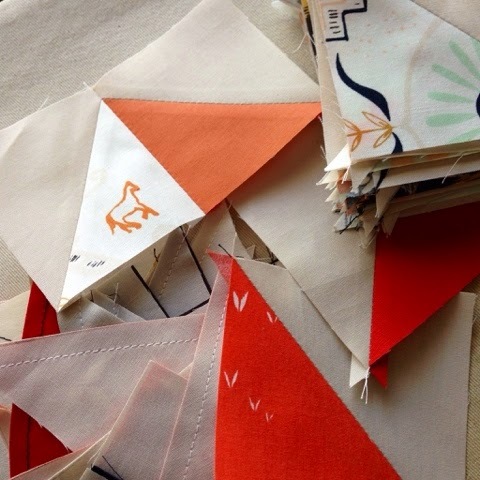 Lots & lots of HSTs! I am using AGF Pure Elements solid in Sandstone for the background. I love the way the colors are all playing together and cannot wait to see this one come together.